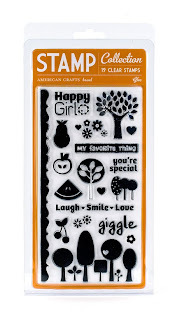 American Crafts has been producing high-quality scrapbook supplies since 1995. I personally, have been in love with just about everything they come up with. Their simple, graphic style appeals to my modern creative spirit. I was over the moon excited when I discovered that they have acrylic stamps. 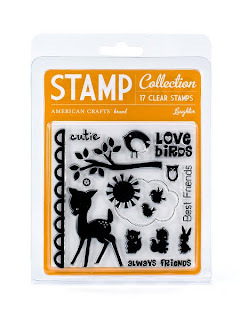 I am an avid stamper, and the clear acrylic stamps are hard to resist for many reasons. 1. They are clear, so you can see EXACTLY where you are stamping. 2. They are smaller, and much easier to store. 3. You get WAY more for your money. Typically, you can purchase a whole set of stamps for the price of one wood-mounted rubber stamp. I love that nearly every set of stamps has a border stamp. They are super easy to use, clean stamped images and easy clean-up. There are lots of sentiments and images to choose from. The smaller stamps (letters mostly) aren’t as sticky as I would like them to be. I would like to see more fonts in the future. For this welcome card, I used the Ginger font for the sentiment and the cloud and sun stamp from the Laughter set. Supplies used: American Crafts patterned paper, stamps; Fiskars border punch; Offray ribbon. For these two baby cards I used the Ginger font, and the animals from the Laughter set. Supplies used: American Crafts patterned paper, stamps; Offray ribbon; Pre-scored card by Halcraft. And, for this last card I used the trees from the Glee set and some of the animals from the Laughter set. Supplies used: American Crafts Stamps; Cosmo Cricket and CK patterned papers; Offray ribbon; Heidi Swapp Chipboard; Hero Arts pre-scored card. Overall, I am very satisfied with the sets that I have and will be purchasing more in the future. Do you have any of the American Crafts stamps? Do you love them? Hate them? And why? Now that I have reviewed them, will you be off shopping for them later? Tell me, tell me, tell me! I want to know! Great review Mandy! Love your projects too!! Great cards, and I agree, AC is awesome!!!!! Thanks for sharing, I love to read your reviews before purchasing something!! Ginger is my most favorite AC font ever!! Can't wait to get some of those stamps. 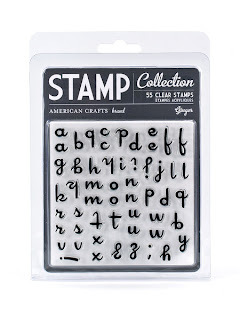 Sad to hear they aren't too sticky ... that's the problem I've had with most acrylic letter stamps. They fall off too easily. Those cards are just too adorable. I really love AC anything and everything pretty much... my question for you is... what is the thing holding up your cards! I must get one of those!!! LOVE AC and will be checking these stamps out! adorable cards mandy!! that is a "floral frog" you can find it anywhere that sells stuff for floral arrangement, near the green foam blocks. Love your projects! I love using stamps on my projects although I like rubber stamps better. They hold there shape better... I think so. You should do a review on Unity Stamp Company. Their stamps are amazing!!! Cute, cute, cards Mandy!! Great review! One thing I really like about American Crafts stamps is that they are thicker than some other brands. This helps prevent some of the twisting, distortion and even tearing that other clear stamps can be prone to. For those of you having issues with clear stamps losing their stick. Aleene's (the gold bottle glue company) makes a product called Tack-it Over and Over. You just clean you stamp well. Get off any fuzzies and crud if there is some. Then paint a thin coat on the back of the stamp let dry over night and the are good to go. On thinner stamps I do recommend some caution as the first few times they can stick too well to the block. I've heard but not yet tested it that this same product can be used to make your own glue dots. Mandy you are the BEST! Thanks so much!!!! Great review! I really love those images and especially like the border stamp included with each set. Now I really want to buy some!